Why Vitamin K-Max™ by Maxi Health It is Vitamin K2 and barley grass. 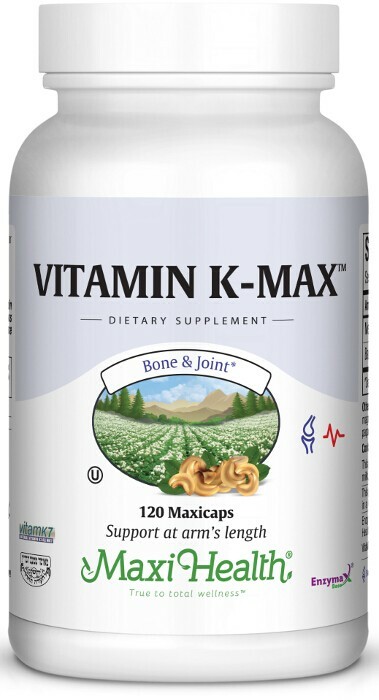 Maxi Health’s Vitamin K Max™ contains the most active form of K, designated as VitaMK7® Menaquinone-7. Vitamin K-2 is not stored by the body. It offers support for blood clotting, calcium regulation, and is an antioxidant. Barley Grass offers eight amino acids, detoxifying properties, low fat vegetable protein, and enzymes. These include potassium, calcium, magnesium, iron, copper, phosphorus, manganese, zinc, beta carotene, B1, B2, B6, C, folic acid, and pantothenic acid. Barley grass contains significant amounts of chlorophyll. It works with the Vitamin K-2 to enhance its assimilation and function. Get the benefits of Vitamin K-2 and Barley Grass today! Get Vitamin K-Max™. Take one (1) or two (2) Maxicaps™ daily, or as directed. This product contains no animal products, wheat, salt, yeast, gluten, milk, artificial flavors, colorings or preservatives. Enzymax®, a vital digestive enzyme complex, is a registered trademark of Maxi Health Research® LLC. • VitaMK7® is a registered trademark of Gnosis S.p.A.